“Said he not unto me, She is my sister? and she, even she herself said, He is my brother: in the integrity of my heart and innocency of my hands have I done this. And God said unto him in a dream, Yea, I know that thou didst this in the integrity of thy heart; for I also withheld thee from sinning against Me: therefore suffered I thee not to touch her”( Gen 20:5,6). Abimelech was only a heathen king. He did not have a vision of the God of glory like Abraham did, and yet he had a great fear of God. In verse 8 we read that when Abimelech learnt that the woman he had taken was a man’s wife, he and his people “were sore afraid”. David did not act in innocence and sincerity in Bathsheba’s matter. So he fell into outright sin. He realizes this later and prays, “Create in me a clean heart, O God; and renew a right spirit within me. Who can understand his errors? Cleanse Thou me from secret faults… and I shall be innocent from the great transgression” (Psa 51:10; 19:12,13). 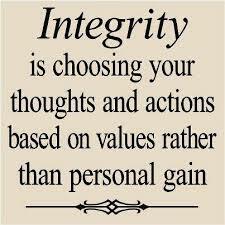 So child of God, whatever you do, do it ‘in the integrity of your heart’. Let not your heart condemn you in anything you do.